One of my earliest memories is going to the Griffith Observatory (I grew up in L.A. for the first 10 years), and insisting that I be allowed to buy a photograph of the outer planets at the gift shop. I remember Jupiter and Saturn being very clear, and Neptune being a bit fuzzy, and each taking up a quarter of the 8×10 print. In the fourth quarter: a field of stars with an arrow at a point of light labeled “Pluto”. I wanted to know why we didn’t have a much closer view! (This was definitely several years before the Apollo missions.) I indeed was allowed to get the photo, and I had it for many years. Sadly, it disappeared during one of my moves. In May 2002, when the approved mission to Pluto was in funding jeopardy, I ran an editorial in This is True urging readers to support it. I don’t know if my editorial helped, but the mission’s Principal Investigator, Dr. Alan Stern, thought it did. He not only said thank you, I was very pleasantly surprised to be invited to the mission launch from Cape Canaveral last year. As a JPLer I had been to a couple of Space Shuttle landings in the California desert, but never to any launches. I got the invitation extended to Kit, and we both went, and I shared my experiences with you. This week I got another note from Dr. Stern. He is mightily bothered that the International Astronomical Union voted last August to adopt a new definition of “planet” to exclude Pluto. He thinks it’s a mistake, and so do I. 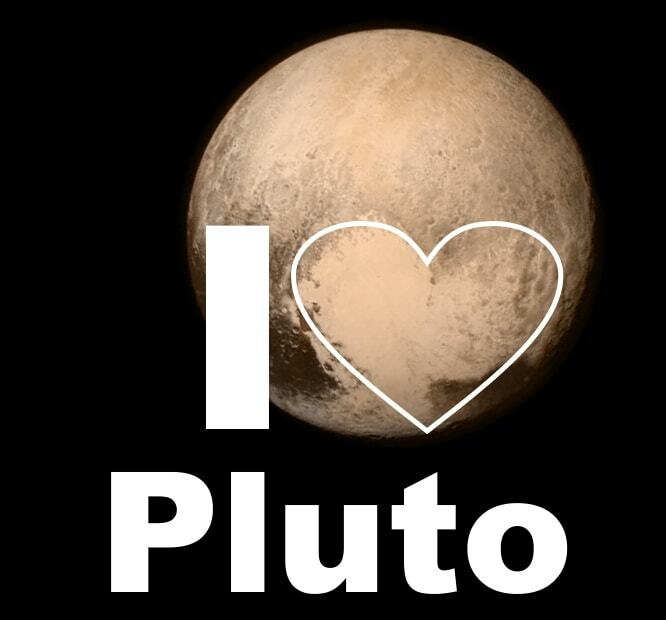 Tomorrow (March 13, the day in 1930 that the IAU announced the discovery of Pluto by Clyde Tombaugh of New Mexico) has been proposed by the State of New Mexico to be “Pluto Planet Day” to both recognize Tombaugh’s discovery and to express displeasure at the IAU’s new definition. The first high-resolution Pluto image returned in 2015 showed a surface feature that looked heart-shaped to many. It’s not just politicians (and the public) who disagree with the IAU; apparently a majority of scientists do too, including Alan Stern, who notes that if it’s strictly applied, even Earth doesn’t meet the IAU’s definition of “planet”! Who else disagrees? The European Geophysical Union, which has voted to come up with its own definition at its annual meeting next month, and the American Association for the Advancement of Science. So why, really, does it matter? It does matter, and here’s why: Pluto is the tip of a huge iceberg, an entirely new class of objects that make up the Kuiper Belt, where there are perhaps 100,000 planetoids, with as many as 1,000 of those being the size of Pluto. IAU seems to be afraid that planets will not be “special” if there are a thousand or more bodies with the title; they’re just these rocky, icy things way out there; they’re ordinary, not worthy of a second look. Well, I’m of the opposite mind: we now know our solar system doesn’t just have nine planets, but more than 1,000, and with that comes the realization that we’ve only explored eight of them! We’re hugely ignorant of our surroundings even in our tiny corner of the galaxy. Without fail, every time that we’ve sent probes to other planets we get huge surprises: we learn new things not just about those planets, but about the solar system, the galaxy, and the universe in general. And what’s the point of existing if we’re not exploring and learning new things? “The cost?” you might ask. In 2002 I pointed out the Pluto probe cost about one-quarter of what we spent that year on …Easter candy. Fundamental knowledge is worth far more than that. We pompous humans need to understand that we occupy a minutely tiny part of the universe. It does us good to stand in awe with our eyes open to the vast amount and diversity of things that are not right in front of our noses. The label “planet” should be reserved for the most special things around us? You bet. Those 1,000-100,000 bodies in orbit around our sun are a part of the neighborhood, and we should understand them better. They are special. But we know nearly nothing about them, and shame on us for our ignorance: it’s time we knew more. By taking away the label “planet” from Pluto and similar bodies, the IAU is sending a message that these bodies are not special, they don’t need to be looked at, it’s not important that they be understood. But the reality is, we have no idea whatever how special they are, and the only way to find out is to go look and learn. I have great faith that like every time in the past, we’ll be surprised by what we find, and understand the universe that much better. We’re not talking about the interest of a few planetary scientists, we’re talking about expanding human knowledge, and expanding the understanding of our place in the universe. That’s “special” indeed, and our language needs to reflect that: Pluto is a planet. Now let’s look at other bodies in the Kuiper Belt and see if they are too. While I agree with the sentiment that all these solar system bodies are special and should be explored, I feel about Pluto and the other Kuiper Belt objects the same way that I feel about the asteroids: originally designated minor planets, once people figured out how many of them there were, it was decided that they deserved a separate name of their own. I feel the same way about the KBOs. As I understand it, part of the problem with calling Pluto a “planet” was the fact that pluto’s moon is nearly the same size, and would therefore also be a “planet”. That would lead to other complications as the definition of “planet” doesn’t include two bodies of like mass moving in the same orbit around the sun. Isn’t there also at least one asteroid that is nearly the same size as pluto? Wouldn’t that also be jumped up to the same definition of “planet”? I’m in favor of extending the designation of planet to however many bodies are out there orbiting our sun. It’s just too much to think about otherwise. Boy, do I disagree with you here, Randy. Ever since I learned about Pluto in Junior High, I have never thought that it should be classified as a planet. It is just too different from all of the real planets. Perhaps the IAU’s definition needs refinement but, in my opinion, the idea is sound. From the outset relabeling Pluto has elicited a very emotional reaction by everyone opposed to it. But, this is science not religion or politics. In science labels do not change the value of a thing. In this case, the new classification results from a better understanding of the objects in our solar system not from an attempt to denigrate Pluto. I do agree that in science, labels don’t change a thing. That’s why my argument had to do with the public’s understanding and the human knowledge base. That’s what’s in need of inspiration. And heck, even scientists need inspiration sometimes too. Maybe that’s why the majority of them want the definition revamped with more care. You’re so right. My grandfather, who died weeks short of his 93rd birthday with his mental faculties intact, always said, “The day you stop learning is the day you start to die”. I try to live by that statement. I can’t understand people who don’t want to try new things, or learn anything. Learning something new is the most exciting thing you can do (in public) for your entire life. Keep Fighting the Good Fight for sanity, tolerance, and using one’s brain. While I certainly understand (and to an extent share) your views about how the IAU definition was perceived, there was actually some decent science behind it. I agree that the definition was extremely poorly worded, but I suspect that the wording was a result of the resolution being put together overnight after the first proposed resolution failed. For those interested in learning more about the way planets are defined, and the concept at the heart of the IAU’s definition, a draft version of a recent paper called “What is a Planet” (Soter, S. 2006, AJ, 132, 2513) is available (free of charge) on the arXiv science pre-print service in its astrophysics section here. The paper is short (7 pages), but quite well written. In particular, I draw your attention to Figure 1 (on the second page) and Figure 3 (on the fourth page) which provide part of the rationale for why Pluto wouldn’t be considered a planet (nor would the other KBOs, or larger asteroids). Although I agree that, to some extent, the definition can be seen as saying that Pluto and the Kuiper belt “aren’t important”, I think that the “Dwarf Planet” category actually deals with that to some extent, and I think that the definition used by the IAU is probably the best one they could have come up with (although I don’t see why “planet” had to be defined in the first place as a scientific term). And I would argue that if a definition has to be made, the IAU is a more appropriate body than either the EGS or the AAAS. For reference, while I am neither a member of the IAU nor a professional astronomer, I am a doctoral student in Astronomy and I have found that, of the planetary scientists I spoke with about the definition, the majority support the IAU’s definition (or at least its intent — everyone seems to feel that it was worded badly). Either way, it’s something to think about. Call me a sick person: I actually watched IAU conference, noting few attended the conference. Some in the sparse audience stood expressing their disapproval of what deemed to me as predetermined by those who were on the stage. I hold with as much reverence with the decision that Pluto is not a planet as I do the nutritionists that claim milk, honey, raisins, butter, cheese, apples, water, etc. are bad for you. As for the thinking class of people, a debate can be brought up on any subject. It is the foolish ones who push their beliefs when there were so few scientists or great minds at the venue then claim that they are right since there was agreement with those who attended the event. By my observance they were not in agreement. Many were not able to share their concerns of the forced issue of Pluto not being a planet. In my opinion this was a gross misuse of power that neither is just or correct. Thank you for your editorial on the importance of space exploration. I get so TIRED of people saying what a waste of money it is. As you pointed out, every successful mission gives us entirely new information about where we all came from. Although its underpinnings are engineering, space exploration is probably the most exciting example of “pure” research around right now – research done for its own sake, and for the sake of what we might find. There may be “practical” applications in the future, which would be great, but it’s important to continue to value knowledge for its own sake. But that extends to a smaller scale as well. How many Americans actually know what’s happening on earth? I used to read New Scientist to get IMPORTANT news about what’s happening in the US. New Scientist is pubished in the UK. Thanks for the Pluto story. I’m glad you made a new friend and made a difference our perception of what’s in space. I’m not particularly interested in astronomy nor space exploration. But even I can see the benefits we’ve already received from such endeavors. For those who wonder why we ‘waste the money’ on it, consider that the invention of solid state electronics (transistors) and, subsequently, micro-electronics in the form of chips back in the 60’s were driven by necessity of size and power management. Such necessity additionally led to the creation of micro-computers now used in your homes, geosynchronous orbiting satellites that provide over 100 channels of television for your entertainment, and the proliferation of the Internet. When you consider that a 25″ color TV sold for upwards of a $1,000 in 1975 (nearly $3,000 in 2007 dollars) and now you can buy a 50″ LCD set that’s sharper, brighter, and lasts years longer, consider the earthbound benefits of space exploration. Sure, such benefits would probably have arrived without so much expense, but not for 50 or more years longer, if then. I share your indignation over the demotion of Pluto! Last week I was at a convention of choral directors and discovered a new song for school choirs that shares the lament. It’s called Ode to Pluto: You’ll Always Be a Planet to Me by Mark Burrows. It’s pretty clever. That link [removed: no longer online] will take you to a little info site about the piece. Unfortunately, it’s so new that there isn’t an audio clip posted yet. In general, I lean more to your viewpoint. I am not an expert but I do consider myself fairly well read. I thought that the earth would still be a planet under the new planet “guidelines”. It is my understanding that a planet is a body orbiting a sun that clears it”s path of other bodies. In that case, the moon is orbiting the earth so the earth has cleared its path. Maybe I am wrong. It may be a good idea to go over this subject at the definition level. I did not know that most scientists did not like the idea of Pluto not being a planet. Anyway, I am looking to more information on this subject. It does seem to me to be confusing if there would be 1000 planets orbiting our sun. As an amateur astronomer, planetarian, and space buff I read with interest your take on the Pluto controversy. Personally I have no problem with calling Pluto a planet or not. Pluto doesn’t really care and it keeps on orbiting the sun regardless of what we call it. My concern is the thought that just because we don’t call it a planet it is no longer special enough to warrant study. I don’t understand how you arrive at this. NASA has put a lot of time and money into studying non-planets. There has been much investigation of study of the moons of our planets, in particular those of the gas giants. We’ve launched probes to visit comets to image them and collect samples for study on earth. Spacecraft have visited asteroids and even landed the NEAR Shoemaker probe on the asteroid Eros. None of these objects qualify as planets and yet they are special enough for us to explore and study. Pluto seems to fit into the category of Kuiper Belt Objects, KBOs. These are objects that we’re just beginning to get a grasp on. Over the coming years there will be a lot of energy put into understanding these objects and what role they play in our solar system. Planet or not, they are just as special as any other part of our neighborhood. I favor an idea I heard during this debate of naming these minor planet sized objects Plutoids, thus passing on an honor to Pluto of being the first of them to be discovered. I disagree with this. I doubt that the public understanding of a planet will increase if we have thousands of them. I even can imagine that coming up with a new class of objects orbiting the Sun might create more inspiration than filling up an existing category. To give you an example, more than 100 exo-planets have now been found, and it is clear that new findings do not create as much excitement as the first ones. All these planets have a size comparable to our giant planets or larger. If we would find a earth-sized exo-planet (orbiting a normal star and not a pulsar) and we would not put that into a special class, it will probably create much less excitement (just number 137 or so) than if we consider that planet a member of a new class of exo-planets. I look in the same way to our own planetary system. Having now defined a new class of objects with special characteristics will likely create more interest and excitement than continuing calling them planets. One can say now that the Pluto mission is the first mission to a dwarf planet, and not any longer a mission to one of the 12 planets. Furthermore, by naming them different I think that the public will become even more aware that there is more stuff orbiting our Sun. I also agree with one of the previous comments, stating that the IAU is the appropriate body to make decissions about these definitions. Because allthough the AAAS and the EGU have links with planetary research, there are mostly non-experts involved and I doubt if they all can oversee the consequences of their ideas. It is like the AAAS deciding in which category a newly discovered fish will fall, let the biologists do that themselves. Finally, the fact that the discoverer (Mike Brown) of the former 10-th planet now largest dwarf planet, Eris (well chosen name, don’t you think so? ), also supported the new definition is a sign to me that the new definition is quite appropriate. As my new tee shirt says, “SIZE DOESN’T MATTER TO PLUTONIC FRIENDS”. Actually, Mike Brown is only one of a three-member team that discovered Eris. David Rabinowitz, another team member, signed a petition by Dr. Alan Stern, Principal Investigator of New Horizons, opposing the IAU’s new planet definition. There is no reason an object cannot be both a KBO and a planet if it has achieved hydrostatic equilibrium, meaning it has sufficient gravity to have pulled itself into a round shape. Most KBOs do not fit this category. Pluto, Eris, and several other large ones do, and these should be considered a new subcategory of planets known as ice dwarfs. However, there is no reason ice dwarfs should not still be considered full fledged planets, just of a different type than the other subcategories of terrestrial planets, gas giants, and ice giants. Notably, only four percent of the IAU took part in this vote and most are not planetary scientists, meaning planets are not their area of study. That along with the statement that dwarf planets are not planets at all make this definition untenable. This must be revisited in 2009 and in a way that allows all IAU members to participate, i.e., electronic voting for those who cannot be physically present. Randy, has your opinion changed any since 2007, especially in light of the massive publicity around this year’s fly-by? For the general public to be so interested in New Horizons and the gorgeous photos of Pluto and Charon is heartening and a sign that people can be inspired by a science & exploration story, however we class Pluto. For future stories such as proposed fly-bys of other KBOs, Pluto being ‘first among equals’ as a KBO somehow gives more of a hook to reacquaint people with the mission. To the person who claimed that the moon orbits the sun, I disagree to the extent that I believe that an object should be considered to primarily orbit one body or another. Luna primarily is in orbit around the Earth. The sun has comparatively little effect on the orbit of Luna. When we look at Pluto and Charon (did I remember its name right? ), we have a case where it can easily be imagined that Charon also orbits the sun, but we are then recognizing that it is part of a bi-planetary orbit, if I have used the correct term.